(March 1969) -- With just one month to go in his tour of duty in Vietnam, Marine Cpl. 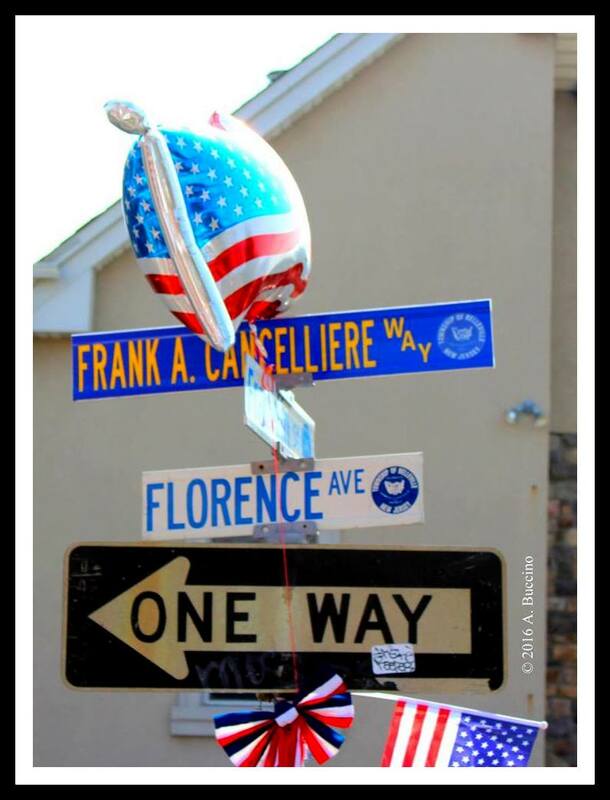 Frank A. Cancelliere, of 23 Florence Avenue, was killed March 15, 1969, by an American grenade that exploded accidentally near Quang Tri Province in Vietnam. 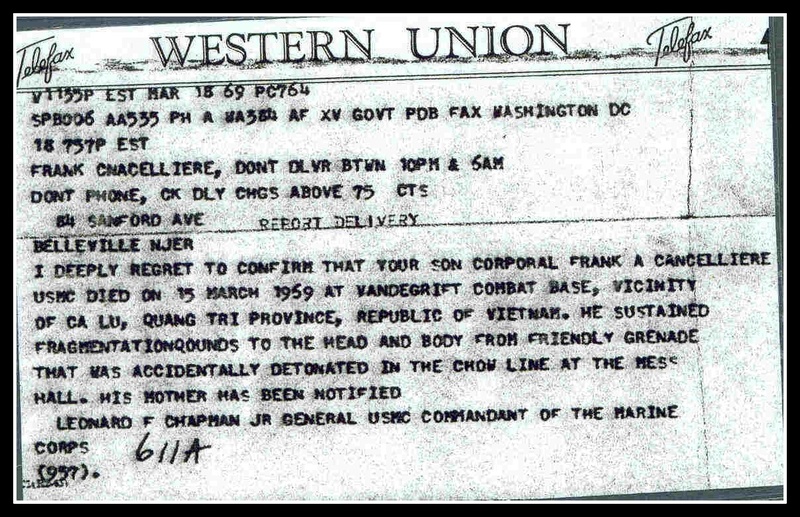 According to the official report, he died as a result of fragmentation wounds to the head and body from a friendly grenade that was accidentally detonated in the chow line at the mess hall. 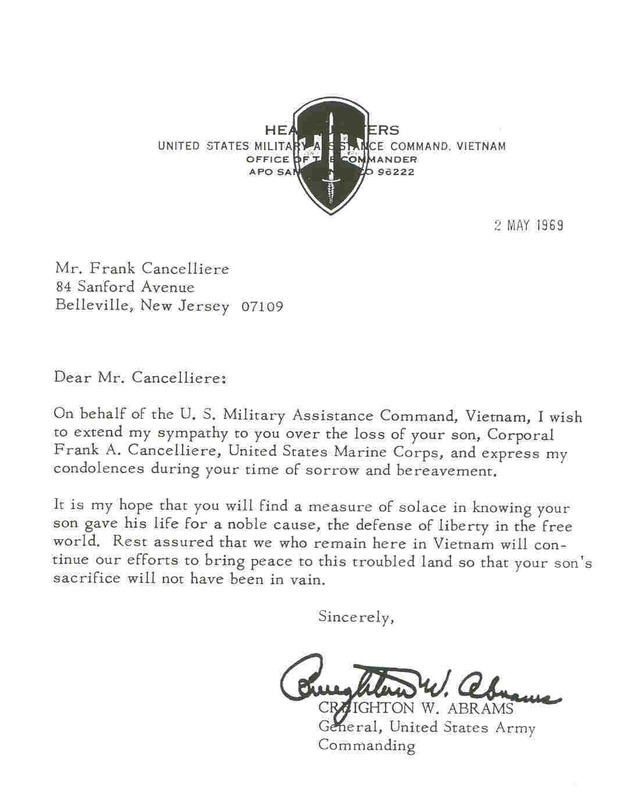 Cancelliere enlisted in the Marine Corps in September 1967. He began active duty on Sept. 13, 1967, and was ordered to Vietnam for a 13-month tour on March 17, 1968. He served with the CO B 1st Battalion, 3rd Marine Division, FMF RPO San Francisco. A lifelong resident of Belleville, Cpl. Cancelliere was a graduate of Belleville High School and worked for the Belleville Tool Corp., before joining the Marines. Born on June 27, 1948, Cpl. Cancelliere, 20, is the son of Mrs. Fannie Albano of N. 7th Street, and Frank Cancelliere of 23 Florence Avenue, Belleville. He is survived by brothers, Joseph of Belleville, and Robert of Newark. Cpl. Cancelliere is buried in the Belleville Avenue Cemetery, Bloomfield, N.J.
Florence Ave. at Franklin St.